Propolis comes in several forms but it can be a challenge to ingest. Here's how to take it safely and effectively. 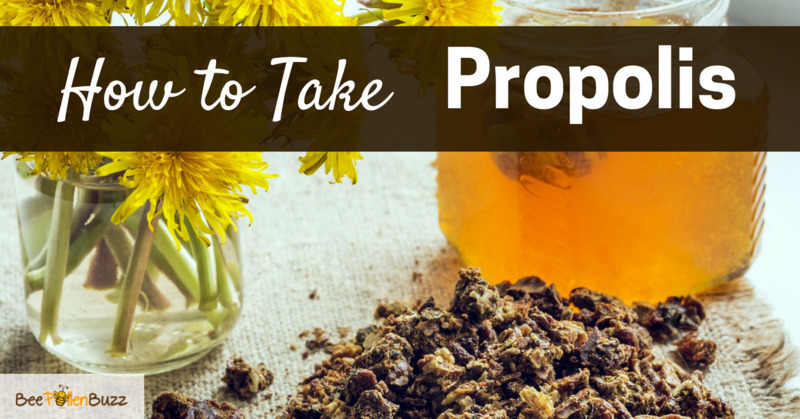 I get asked quite frequently how to take propolis properly. Seems there is some confusion about how to take this powerful ingredient known as 'bee glue.' Propolis is an extremely useful supplement that has many health benefits when taken properly. 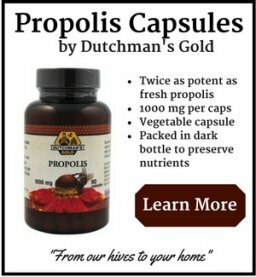 The first thing you need to know is that there are several forms in which bee propolis is available. These include tinctures, raw propolis chunks and also capsule form. You can also find it in powder form. You will see two types of propolis tinctures on the market - those mixed with alcohol and those mixed with water. Generally, the alcohol based tinctures will be stronger - they usually contain a higher percentage of propolis. 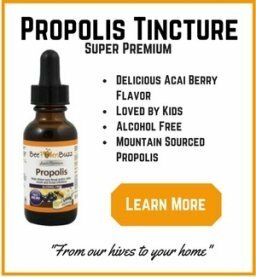 Our alcohol based propolis tincture is 50% propolis. 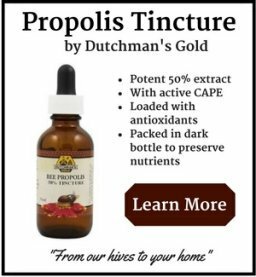 For general health purposes, I recommend a third to one half dropper full of the 50% propolis extract daily. The 50% propolis is best squirted directly into the back of the mouth and swallowed directly as the resins in this ultra-pure product give it a waxy texture. It is difficult to mix as a result of this. I have people tilt their heads back and squeeze the tincture right into the back of the throat. Our 20% water base propolis is more suitable to mixing into liquids but also tastes better too as it is diluted. Our water based propolis tincture is 20% propolis extract. It also has a milder taste and is less waxy due to the lower propolis content. I recommend one full dropper of the 20% water based tincture daily for general health. For those of you wondering what propolis chunks are, let me explain. 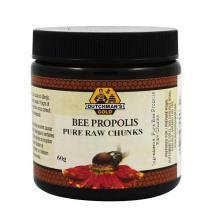 Propolis chunks are simply raw pieces of bee propolis. Unprocessed, raw and 100% pure, these are the real deal. You simply chew or swallow them whole. One word of caution - propolis is a dark brown substance that can stain your teeth so be careful if chewing the chunks. For general health, I recommend 1 - 2 chunks of raw propolis per day. If I am fighting a cold or trying to prevent one, I double or even triple this. Propolis is the very best supplement I've ever used for preventing colds. And remember, if you are treating a specific health condition with propolis, you'll want to adjust your dose up accordingly. For general health purposes I recommend two or three 1000 mg propolis capsules per day. Capsules are super convenient and are simply propolis powder in a gel cap. This is what I travel with. With its strong anti-viral and anti-bacterial properties, propolis is great for preventing colds. In the event you do get a cold and want help getting rid of it ultra fast, take 6 - 8 capsules per day 2 capsules at a time. If you are treating a serious health condition, higher doses of propolis are safe. It is always best to speak to a Holistic Health professional like a Naturopathic Doctor about your condition and a requisite dose. 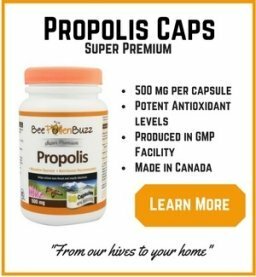 Now that you know how to take bee propolis, just make sure that the product you are taking is a quality, North American sourced product that you can trust. Make sure there is a 100% guarantee behind the product and the company that makes it is really in the bee business! There is a lot of cheap, offshore propolis on the market that I'd suggest you avoid.